In this week's edition of MMA Diet 101: How important is protein for our body and how should it be consumed? It’s no mystery that protein builds muscles and that it is made up of various amino acids. Hence, most fighters make protein and protein supplement the cornerstone of their unbalanced diet. Typically, scientific advice would say that athletes of any discipline must take one gram of protein per pound of body weight. But wouldn’t that make the fighter think too much about food measure? In reality, there is no perfect number of protein intakes. All that a fighter needs to do is take some protein with each meal. The most common sources of protein are chicken, buffalo and turkey. However, animal proteins can also make human blood more acidic. Biologically, mineral calcium balances the acidity in the body. That said, too much acid in the body can take calcium away from the bones if necessary. 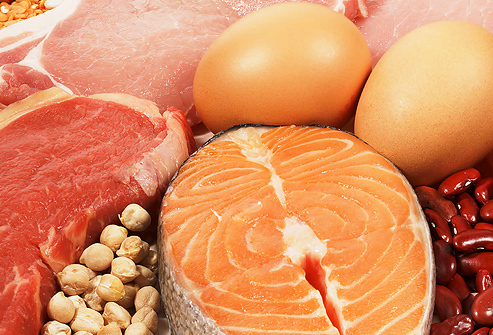 There are various foods that can give quality protein, while also containing healthy compounds. Beans, for instance, are high in protein and in fiber. It also has various heart-healthy and cancer-fighting antioxidant compounds. If you want to have a balance protein intake on your diet, follow these five simple tips. 1. Get some protein with every meal. Regardless if it’s whether from cottage cheese, whole wheat pasta, nuts or buffalo meat, protein will help the fighter recover and feel full for a longer period of time. 2. It is also important to know what type of proteins to take, and when to take them. Proteins like whey is quicker to absorb, hence it is better to take it after a workout. On the other hand, casein protein is slow to absorb, making it a perfect pre-bed recovery shake. 3. Keep a bag of trail mix or piece of turkey jerky with you all the time. That way, you can shift your desire to stop at fast food restaurants on your way from the gym. 4. Limit your red meat intake and avoid processed meat. There are research that suggests eating more than 18 ounces of red meat a week can lead to higher risk of colon cancer. Processed meats, like bacon and hot dog, were also linked to higher risk of cancer. 5. Use protein shakes as supplements only. If you take more than one shake everyday, re-evaluate your schedule and check if you can replace your another protein shake intake by preparing a meal before hand.